By Johnny Benz, Doghouse Boxing - So how did Bernard Hopkins vs. Chad Dawson do in terms of Pay-per-view sales? Probably not very good at all. According to two boxing scribes, the numbers they are hearing indicate a bomb, and a stink bomb at that! 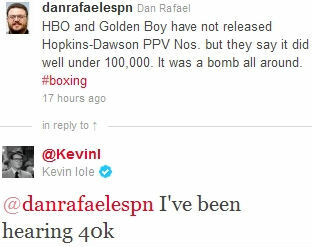 Dan Rafael of ESPN tweeted that he has heard the numbers for the PPV buy rate for Hopkins vs. Dawson are well below 100,000. Let's face it, 100k is a terrible number to begin with... but well below 100k! Kevin Iole of Yahoo tweeted that he heard the fight did around 40,000 buys. 40,000 PPV Buys! If any of these numbers pan out to be true, this was one massive failure. It time for the PPV heads to start rethinking how they sell and package boxing. Steve Kim of MaxBoxing recently wrote: "Making Dawson - Hopkins II would be like making a sequel to 'Ishtar'."